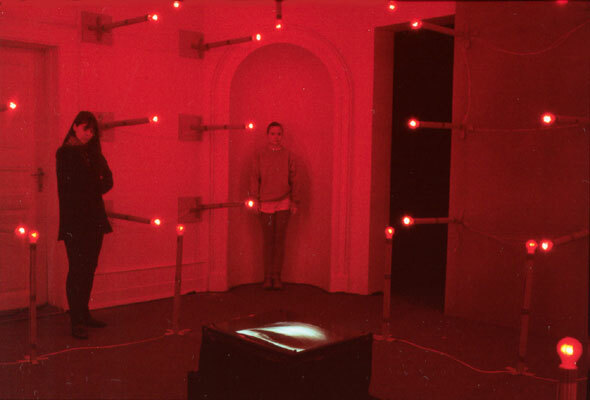 Video and light installation, "Insisting Art", "Bispebolien", Trondheim's Art Association, Trondheim, 1991. Pipes of corrugated cardboard with light bulbs manually painted red were mounted on the walls, ceiling and floor, totally 76. In the middle of the floor there were a tv facing the ceiling, wrapped in black, continuously showing the Eyemachine video. The video is based on one short video sequence with an image of a female eye going from one side to the other and a sound of one reversed male groan at half speed attached to it. This sequence is divided into different small cuts which are repeated creating a rhythm with an image of a vibrating eye and a sound going from an upset irrational heartbeat to a machine gun. The sound was connected to two heavy load speakers and a specially designed colour organ device, which made the light bulbs glow and burn in pace with the sound. The colour organ was divided into two parts. One part acted rationally. But due to a not at first intended error the other part acted irrationally, which added to the impact of the piece. The room vibrated in red light and groaning sound.